Before starting cooking, is very important makes all the ingredients ready-to-use. 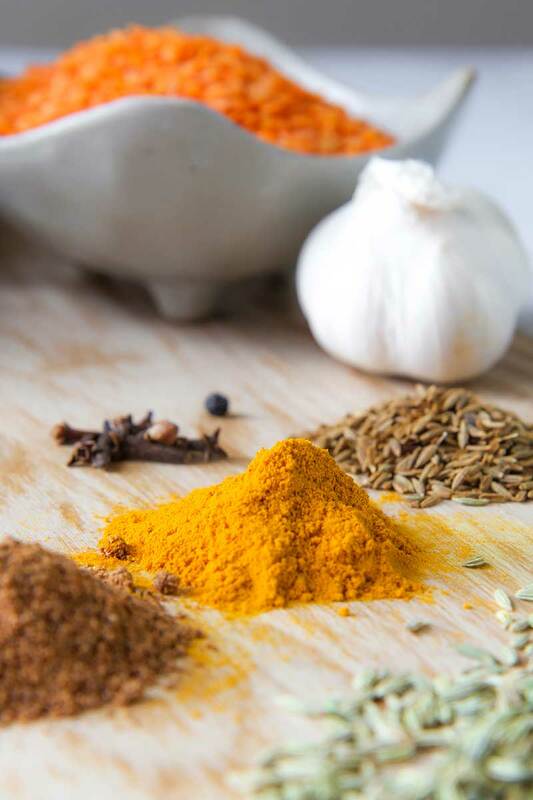 First, mince finely the cloves of garlic and combine with the seeds of fennel, cumin and black mustard, and the chilly peppers flakes, and 1 clove. Now, chop at medium size the onions , and peel and grate the fresh ginger. Finally, mix all the powered spices. If you are not following a special diet, I strongly suggest to use ghee to cook, its makes the red lentils dal flavor unique and tasty! Otherwise, peanuts or sunflowers oil are a good to prepare this recipe. Olive oil instead has a taste too strong and far from Indian style. Pour 4 tbsp of ghee or vegetable oil into a bottom-thickened heavy pot, and place over medium heat. 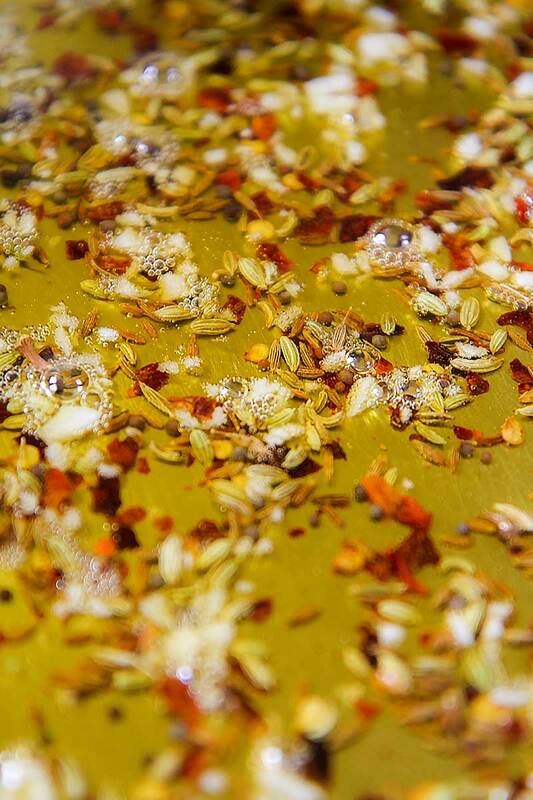 When the ghee is totally melted and hot, pour the garlic and seeds mixture, and stir-fry for 30-60 seconds. Keep an eye on the garlic pieces: they have to become golden but not burned. When the garlic is ready, pour the onions and stir well. Cook stirring occasionally until the onion are smooth and translucent. Meanwhile, the onions and seeds are cooking, wash and rise the lentils. When the onions are ready, pour the lentils into the pot, and stir fry for a couple of minute. Now, add 5 cups of hot water, the mixture of powered spices, the fresh ginger, and the tomato puree. Stir well, and set the heat to cook gently simmering. Cook 25-30 minute adding more water only if the dal is becoming too thick. When the lentils are starting to be mushy, they are ready. Finally ad salt as needed, cook another 2-3 minutes, and add fresh cilantro before serving. 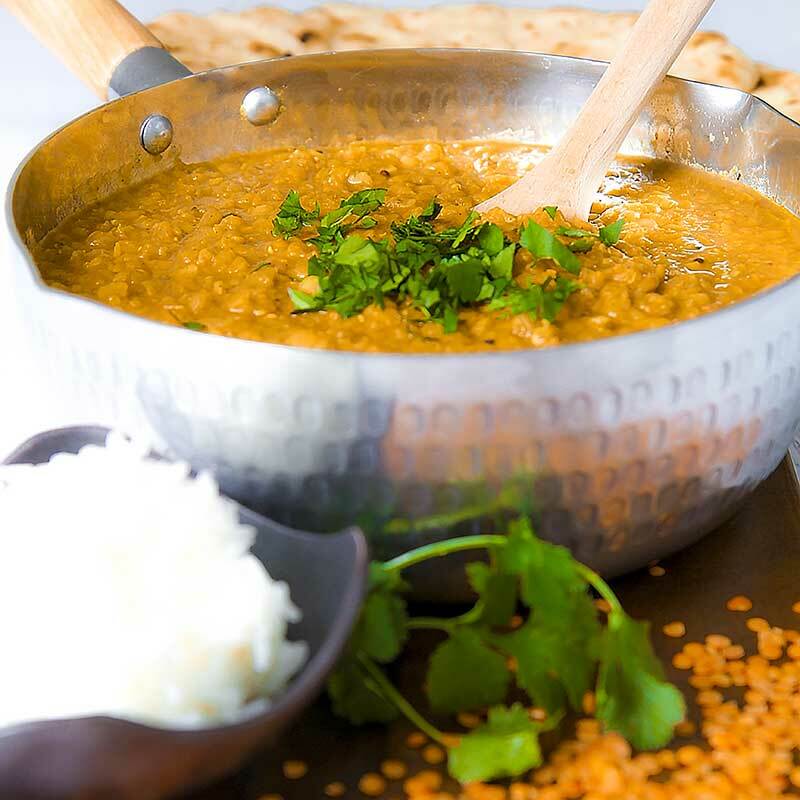 Serve the red lentils dal with steamed white rice, naan, chapati bread, and all the Indian dish you prefer. It is possible conserve the red lentils dal filed into a box and stored in fridge up to 3 days. I found this to be very sour. What did I do wrong? I’m sorry about that. Honestly, is very hard to tell without tasting your dish. Perhaps, try to reduce or eliminate the ginger root. Also some canned tomatoes brands can be particularly sour, consider trying another brand. Let me know how it goes! It is sooo yummy. I loved it. Thanks for such a delicious recipe. I added garam masala powder after dal is cooked. I added a tsp of lemon juice along with coriander in the last. My dal kept burning to the bottom of the pot! Does this happen to you? How can I prevent it? I’m sorry for this! Personally, I make several times this recipe but never happen to burn the dal. 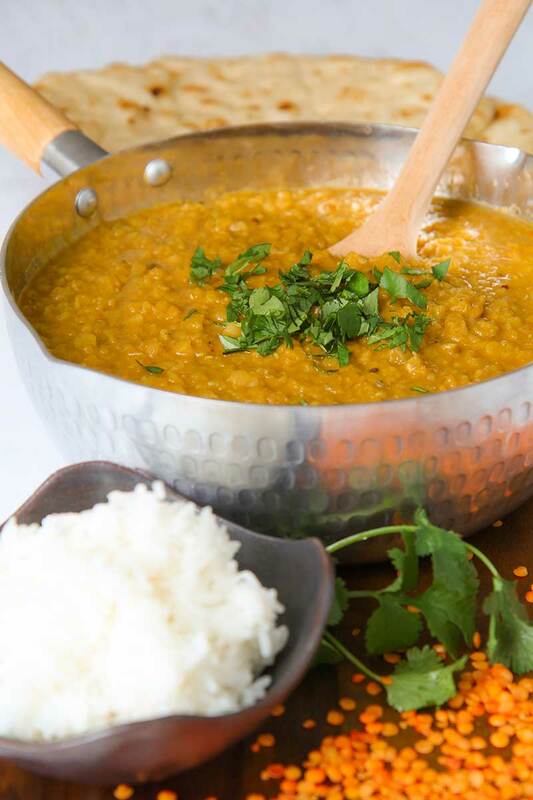 Try to modify the intensity of the heat and stir the dal more often. I’m not a fan of the non stick pots if not necessary, but it could be a solution. 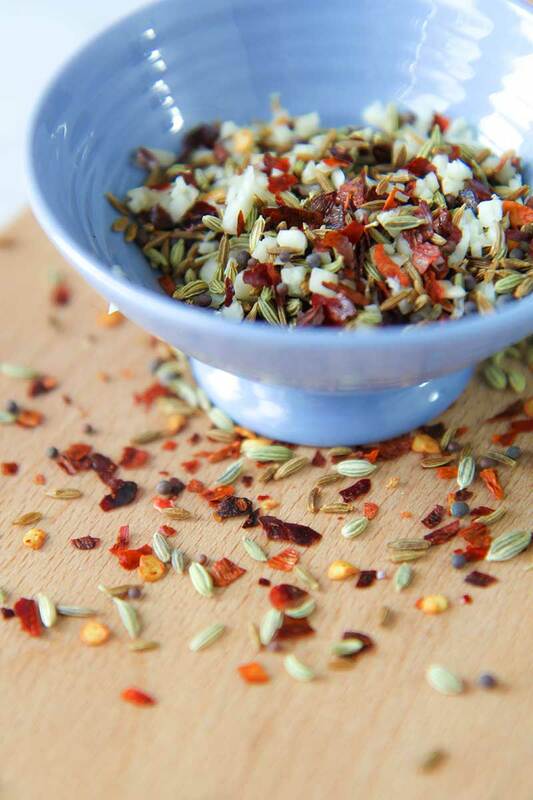 I am making this right now, Fillipo, and the fragrance is mouth-watering as it simmers. Thank you so much for authentic Indian cuisine! Great recipe! I made this yesterday, and added some chickpeas and baby spinach at the end. It was delicious, and the spice mix was soooo good! Yum! It reminds me of the dal I ate in Pakistan. I’m using this recipe from now on. Thankyou! Hello. I followed this recipe exactly. At the end of the cooking time the lentils were still hard and bitter. I am wondering about the lentils. Your recipe does not soecify what type of lentil to use. I used premium whole lentils but maybe I needed to use red split lentils. Would this have made a difference? In your illustration used, are you displaying split red lentils? No knowing much about lentils I think it would be good to know. Thsnkyou. In this recipe, I used red lentils, and I wrote this In the title, in the ingredients list, and in the process description. These lentils cook quickly, and at the end, they become creamy and mushy like the tradition wants. 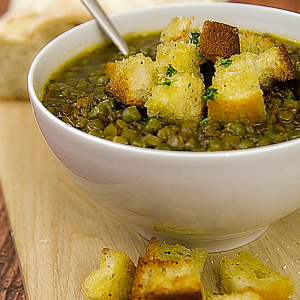 If you prefer to use other lentils, the result will be different. Every kind of lentil requires a different cooking method. Your right, I was a bit harsh and I wish to apologise. I did use red lentils, but whole red lentils. I think your recipe called for red split lentils, so I will make it again using split rather than whole and I’m sure it will work just fine. By the way, my husband really liked it anyway. The flavors were good. This was pretty good, considering I forgot I was cooking it for an extra half hour and then added a bit too much salt. I also left out the mustard seeds (I don’t have any) and the tomato puree (my daughter can’t have acidic food right now). It’s nice to have an easy Indian dish that can do without tomatoes. I’ll be making it more in the future.